Participants in the Polaroid Greeting Swap can find all the information they need about the swap here. Welcome to the #polaroidgreetingswap3! This includes all the vital information for this swap, so please read it carefully. Group emails will be sent by your group leader (aka swap mama for new swappers). I encourage you to print that list, and check off people as you mail blocks and receive them. * Groups: You will be assigned to a group of 12. That means you need to make a total of 22 blocks that you'll mail to 11 people. * Blocks: Make your blocks with quality quilting cotton. Any solid white is fine. When possible, try to follow a partner's preference for colour or designer, if they gave them. If they said "surprise me," make a block you'd love to receive! * Greeting card: Each block should be mailed in a greeting card with a handwritten note inside. This is the fun and unique part of this swap, so please use quality cards and take time to write a nice message. Or if you're super crafty, consider making your own cards! It's not necessary, but it's a nice personal touch. * Mailing: Mail all your blocks by June 30, 2018. You can send them all at once, or a few here and there over the month. * Be cool. If you need to drop out of this swap for any reason, contact me immediately. It is not OK to accept blocks and not send them. Let's make this a fun experience for everyone! * Share! Post photos on Instagram as you make and receive your blocks. Use the hashtag #polaroidgreetingswap3. Saying thanks is lovely! You will have the Instagram name of everyone in your group and can tag them on photos as your Polaroid greetings arrive. It's simple: Start with a 2.5" square. This is your "picture" and a great opportunity for fussy cutting or using those nice scraps you've been saving. Press all seams away from this centre block, and use 1/4" seam allowance. Sew a 1" x 2.5" white piece on each side. Sew a 1" x 3.5" white piece on the top. Sew a 1.5" by 3.5" strip on the bottom. Done! When you receive your blocks, trim them to 3" wide x 3.5" high and they're ready to use in a variety of projects. Don't trim before mailing. 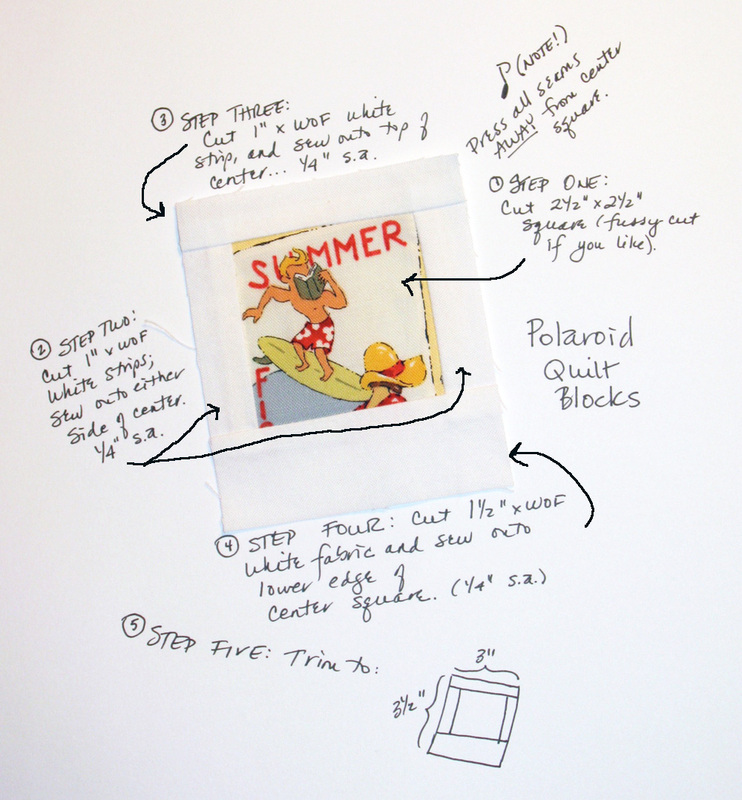 Here's a good illustration on how to make the blocks borrowed from a previous swap. Here's how to chain piece the blocks if you want to make them really quickly. Here's a tutorial I wrote on how to finish your blocks with a shadow. And here are a few ideas for what to do with the blocks you receive. Here's a fun pillow I made with Polaroid blocks. Oh this looks like so much fun. Bet it's too late for this year... please let me know next time you're organizing a swap... Please! correct email (sort of in code) susanshannon67 at gmail. I like to make stuff. Mostly now that's sewing and quilting. Living in Kitchener, Ontario.